Seneca Falls, N.Y. – Water professionals are encouraged to enroll in Goulds Water Technology’s (GWT) new wastewater e-Learning course that highlights the advantages, disadvantages, features and applications of wastewater pumps and accessories. It also includes instruction on how to properly select a wastewater pump, taking into consideration flow, system capacity, total dynamic head and other crucial calculations. The new wastewater e-Learning course is part of GWT’s comprehensive education curriculum that includes in-person Factory School seminars, e-Learning courses and WebEx trainings about the latest advancements in residential, commercial and agricultural applications. An extension of the GWT Factory School, GWT’s e-Learning virtual education program is modified for individual comprehension. 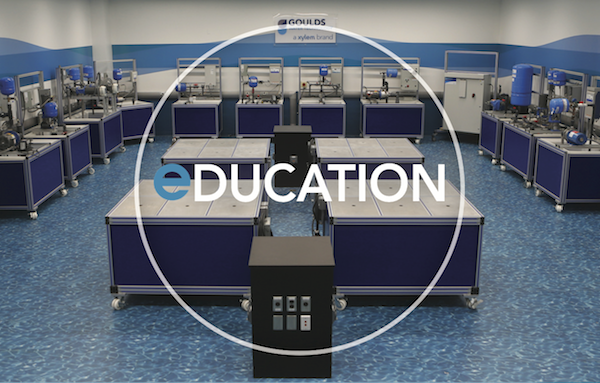 Students can now enroll in three courses – basic water systems training, variable frequency drives and wastewater pumps – that contain videos and interactive online resources. GWT Factory School training courses are held at the state-of-the-art Campbell Education Center laboratory in Seneca Falls, New York, where students learn using actual installations and gain valuable troubleshooting skills. Each course covers the breadth of the GWT product line and related systems, and is available for water professionals with at least one year of industry experience. Online WebEx training seminars can be accessed globally and are intended to provide dealers, distributors, engineers and OEMs with up-to-date product information, troubleshooting support and other training to help grow their business. Each training seminar is approximately one hour long. For more than 30 years, the GWT Factory School has educated thousands of water industry professionals on the latest advancements in commercial, residential and agricultural applications. For course descriptions or to learn how to register for in-person and e-Learning courses, please visit: http://goulds.com/factory-school/ and http://goulds.com/e-learning/.